This week, Zaycon Foods had a Buffalo Wings and Chicken Tenders event here in my area. Since we enjoyed both last time, I decided to get them again. 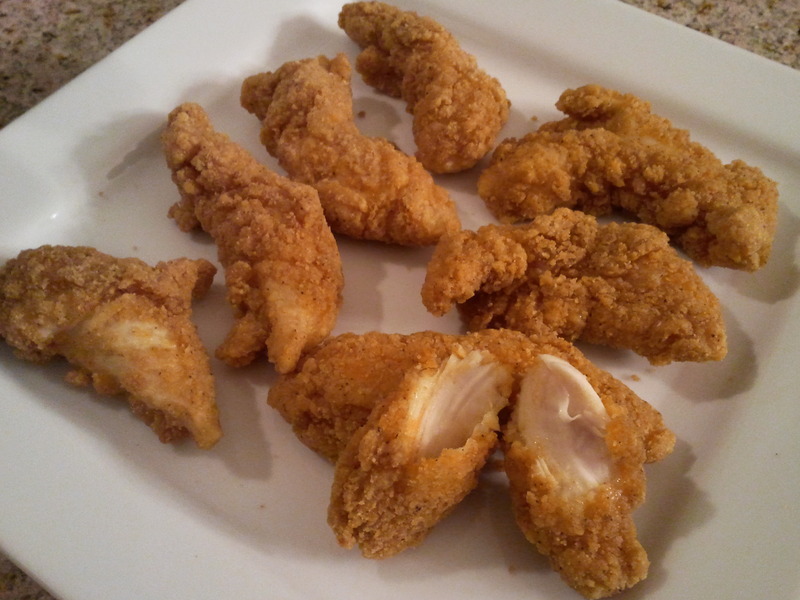 The wings were pretty much the same, but the chicken tenders were fully cooked this time. 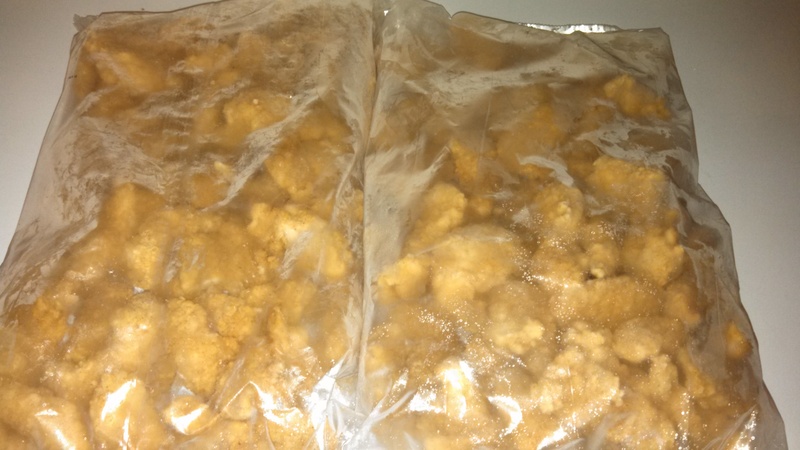 This time, they were $3.15 per pound, and came as four 5-lb bags. Last time, the wings seemed a little on the small side, but this time they are larger and more like what I’ve seen eating out. These are fully cooked, so they just need to be heated through. This picture is just half of the case. I shared this case with a friend, and didn’t get a chance to take a picture until after she’d already picked up her share. 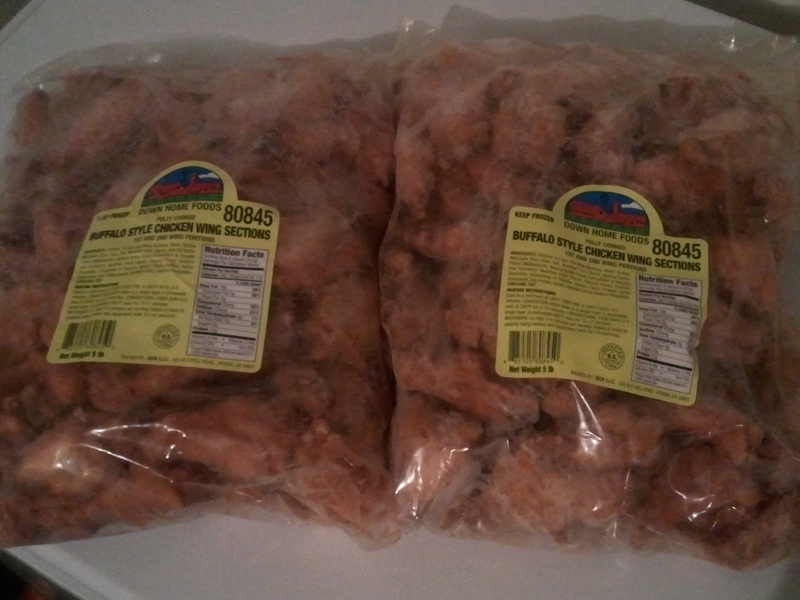 These were $2.19 per pound, and also came as four 5-lb bags. 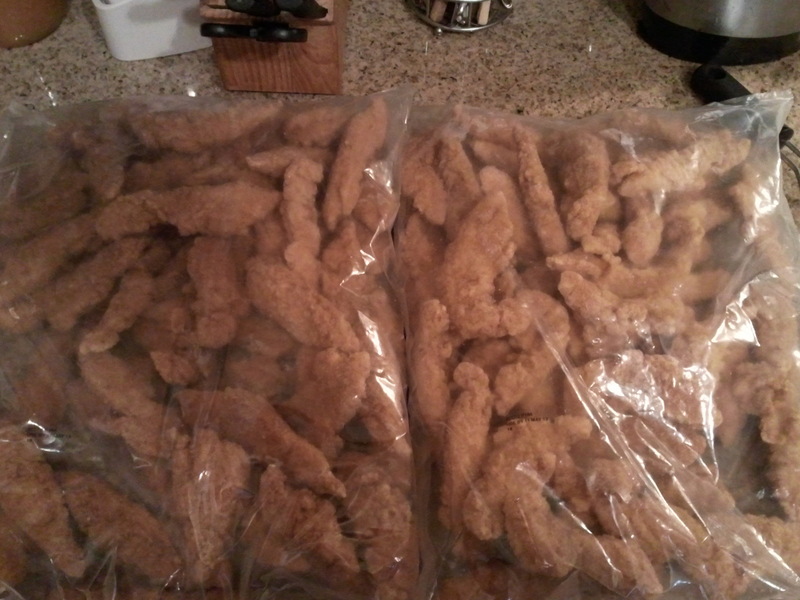 The chicken tenders are in varying sizes, about medium-sized. We will hopefully have a chance to try these out in the next few days. After ending up with plenty of leeks and gold potatoes after Bountiful Baskets last week, we’ve been enjoying plenty of Potato Leek Soup. However, my husband complains about the lack of meat. So, I tried a couple different variations this week, and they were great! 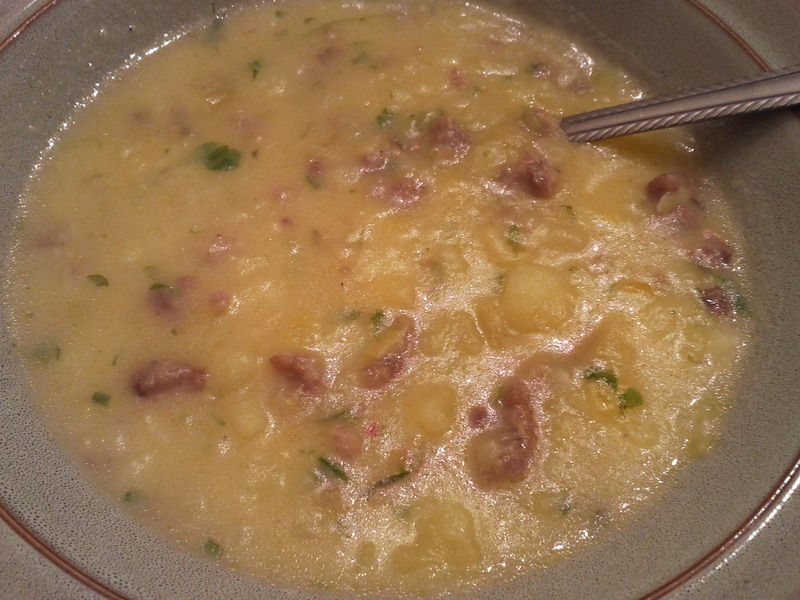 I will update the original post for Potato Leek Soup with these variations as well! They are fully cooked, so really it’s just a matter of heating them up. I cook them in the oven, at 400 F, for about 15 minutes. The ingredients, nutritional information and cooking directions can be found here. They are a little smaller than wings we’ve had dining out, but that’s not a big deal for us. They really are very tasty, I’d say about a mild or medium. I have a very low tolerance for spiciness, and I can tolerate these without too much pain. My husband seems to be enjoying them as well. I don’t think they will last long at our house! 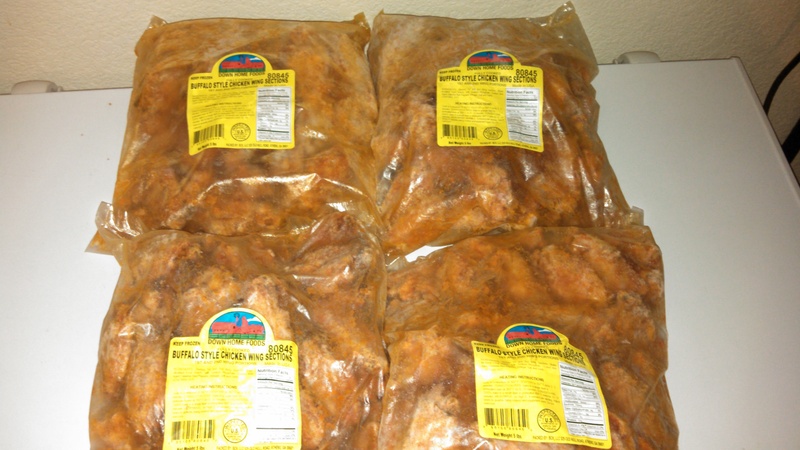 These are not formed chicken, but cut pieces of white meat that are breaded. They are not fully cooked, so they do have to be either deep-fried or baked in the oven (400F for 12-14 minutes, or until fully cooked). They are made by the Pilgrim’s Pride Corporation under the Sweet Georgia Brand, and nutritional information and cooking instructions can be found here. I made some for dinner tonight, and they were pretty good. I cooked them for closer to 15 minutes, but I wanted to make sure they got cooked through. So far, I’m happy with the purchase! 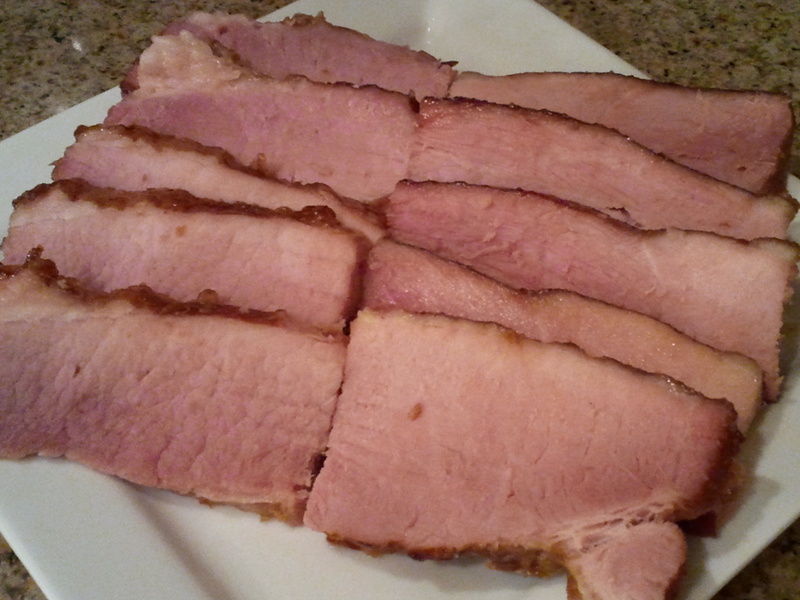 Oh my, this ham was delicious! My husband and I had to stop ourselves from eating too much! 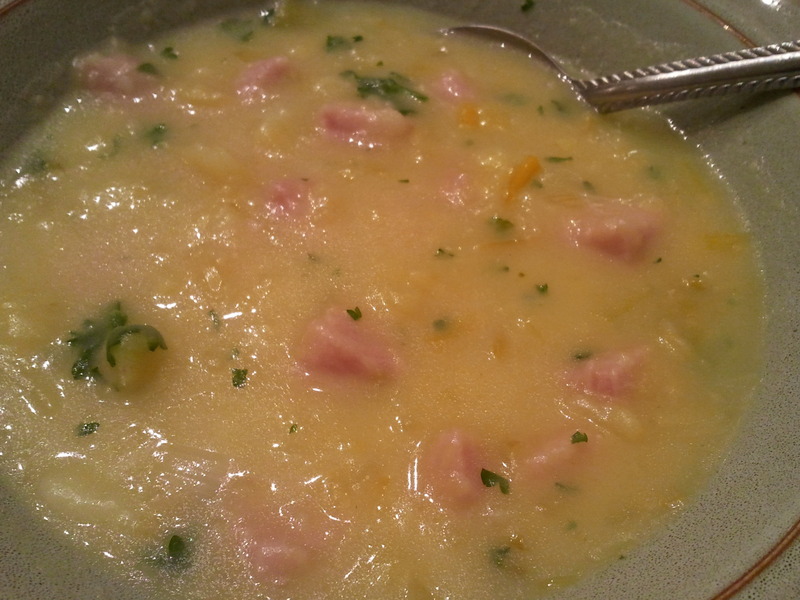 I’m glad I finally decided that tonight was the night for some Zaycon Foods ham! I first cut the ham into 3 sections, which of course I didn’t cut very evenly, so this section was about 4.5 pounds of the 10 pounds that it was. Oh well. It was a good size for us, with slices leftover to lunch tomorrow. This was a fully cooked, boneless ham, so really, I just had to make sure the ham was heated though, then added the glaze and cooked a little longer for added flavor. Yum! This glaze was perfect since I received a pineapple and oranges at Bountiful Baskets this past weekend. The recipe called for pineapple juice, but I just took fresh pineapple chunks and pureed them in the blender. The honey was from a bucket of honey I bought a while back that I finally divided into smaller jars today. Everything tastes better fresh! This does have Dijon mustard, so if you aren’t a fan, I think you could leave it out and still have a nice glaze with the rest of the ingredients. 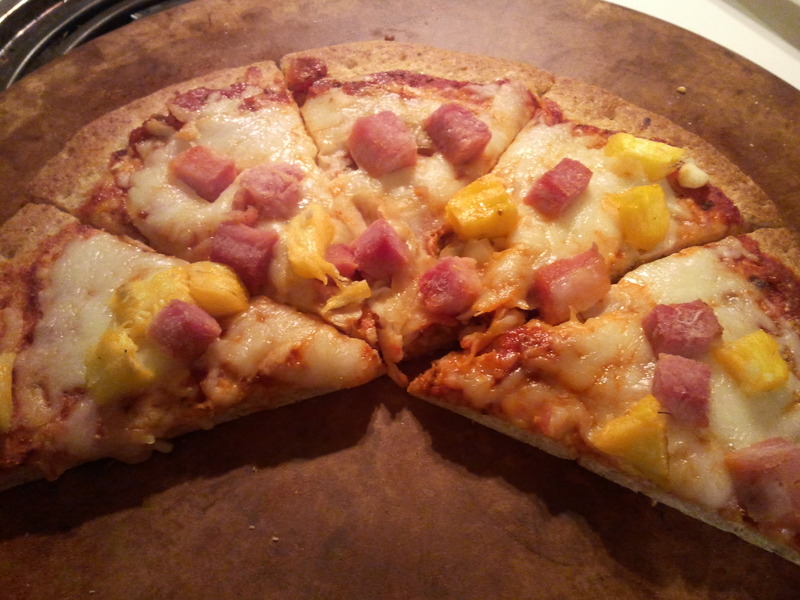 Preheat oven to 325 F. Cook ham according to type and weight, using guidelines on package or here. For my ham, I lined a roasting pan with foil, set the ham in, added 1/2 cup water to the pan, and covered the ham in foil. I cooked it for 45 minutes to make sure it was heated through. Meanwhile, combine the ingredients for the glaze in a small saucepan. Bring to a boil, then reduce heat to low and simmer for 10 minutes. Once ham has finished cooking, remove the foil cover. 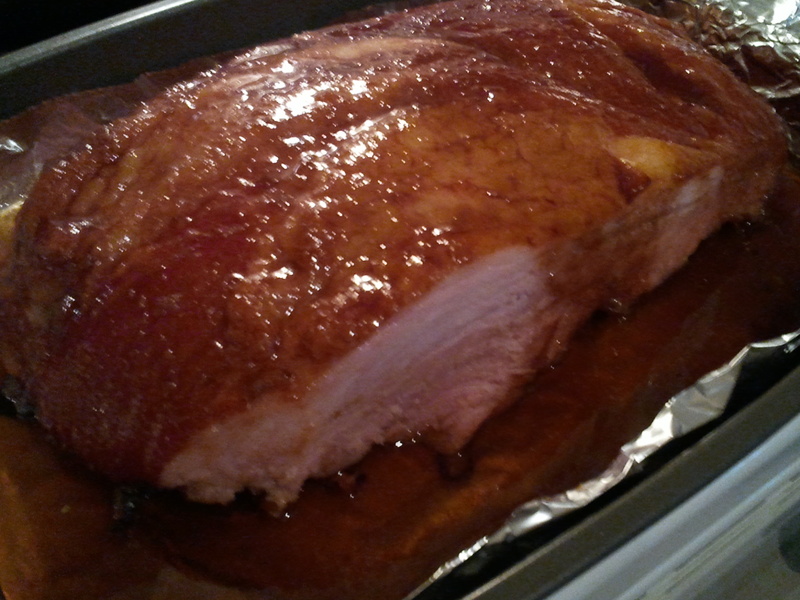 Pour 1/3 of the glaze over the ham, and cook uncovered for 10 minutes. Repeat until glaze is gone, for a total of 30 minutes of cooking uncovered with the glaze. Check to make sure the temperature is at 140 F if the ham was in original packaging, or 165 F for re-packaged or leftover ham. Cook additional time as needed. Slice and serve! 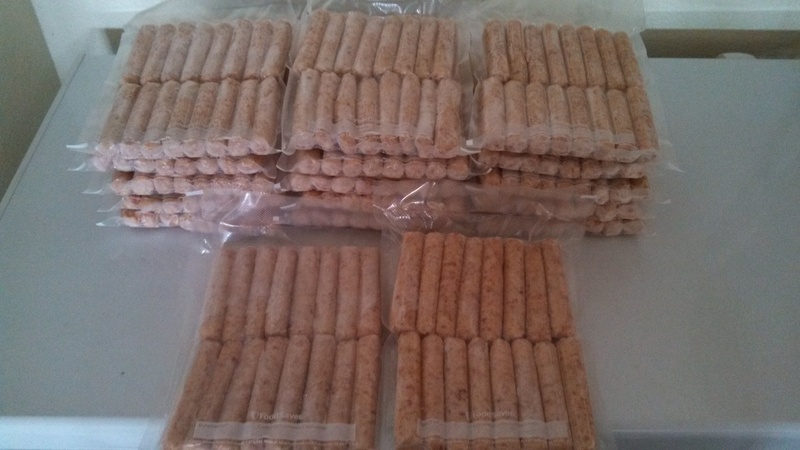 Back in February, I had my first experience with Zaycon Foods, and have been very pleased with their products. 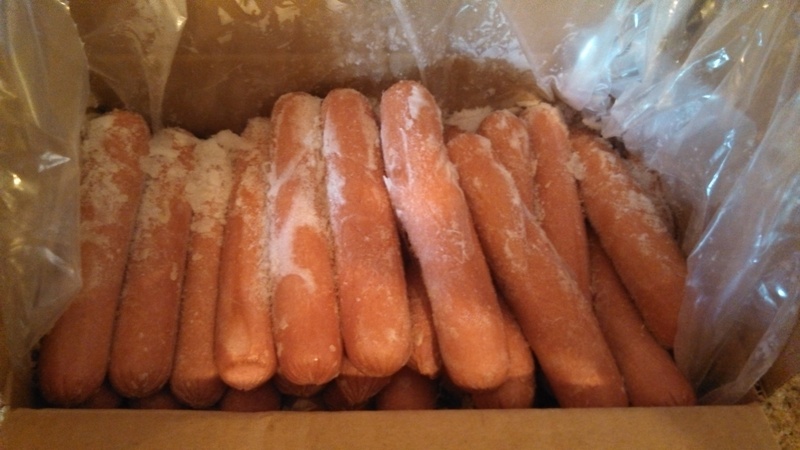 I have gotten Alaskan salmon, cod, shrimp, boneless, skinless chicken breasts, 93/7 lean ground beef, hot dogs, German sausage, and fully cooked grilled chicken strips. My deep freeze has been stocked with meat, poultry, and seafood on a constant basis, which I love because it makes dinner choice a little easier when I have meat on hand already. Well, as long as I remember to take it out of the freezer. There was one product of theirs I had yet to try, the bacon. 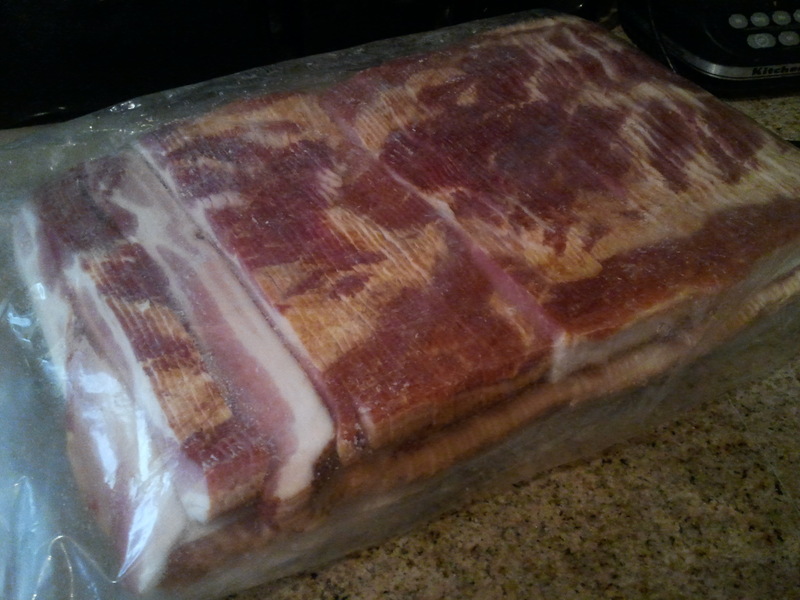 We love bacon in our house, and I had heard good things about it from a couple of friends. So, when they announced a bacon event was coming to my town, along with a ham event, I jumped at the chance to try it! Both were priced at $3.29/lb, and are products of Farmland Farms. The ham unit was 2 10 pound hams. It is a Carve Master Boneless Smoked Old Fashioned Ham. Here is more information on the ham from the e-mail they sent out: This Ham is made from fresh outside muscles only, for excellent flavor and texture, slow smoked with real apple wood to give the ham a unique true smoked flavor. With less than 10g of fat per 100g the USDA has approved this ham as LEAN, with this special cure there is no MSG, this ham is completely boneless, meaning higher yields and easily carved from end to end. 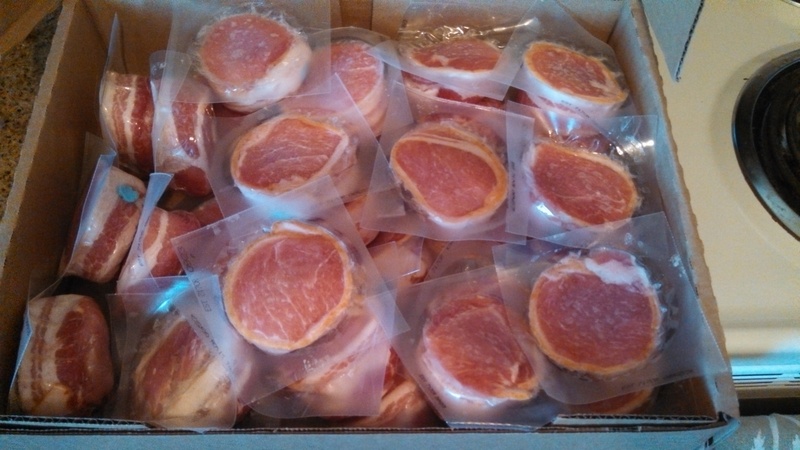 The Ham is packaged by the case this includes two 10lb hams that are individually vacuum sealed and has guaranteed freshness up to 100 days. 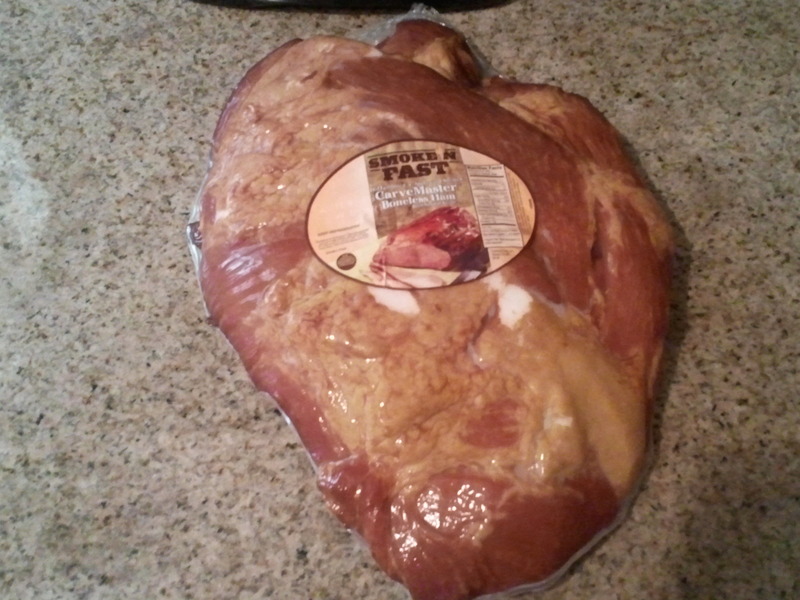 I am not sure what I will do with this ham yet, but I’m excited to get to try it! It is fully cooked, so I may slice it up for cold sandwiches or I may heat it in addition to our turkey for Thanksgiving. 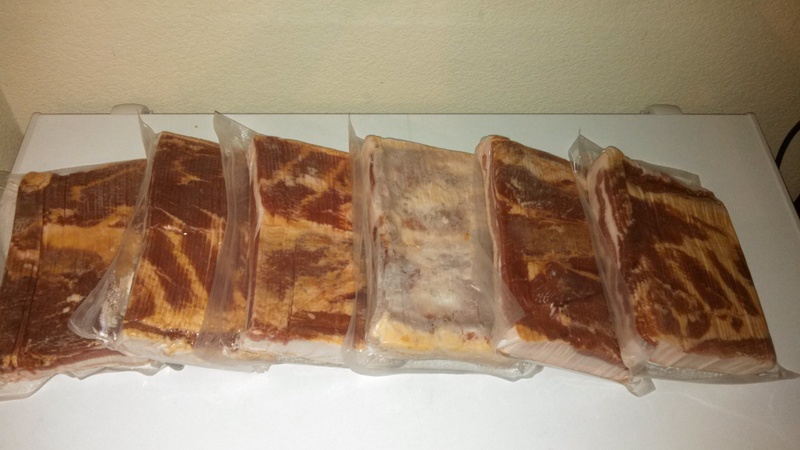 The bacon unit was 2 15 pound boxes of bacon slices. It is Fresh Hickory Smoked Bacon. 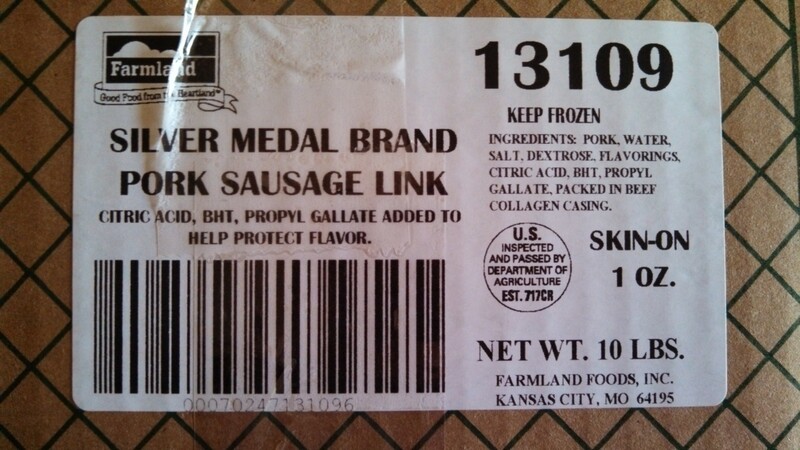 Here is the product description from their e-mail: This bacon has had the same award-winning cure since 1959, cured for a minimum of 24 hours, and hickory smoked for at least 7.5 hours, the smoking process includes only actual hardwood chips burned in the stocker, this creates the color and flavor that makes this cure so special, in addition to color and taste our bacon has been carefully hand trimmed from each belly for consistent sizing. It is a nice, thick cut bacon. We had some for breakfast the morning after getting the bacon, and it was really good. Honestly, I’m so used to eating turkey bacon, I wasn’t sure how the pork bacon would go over in our house, but we all thought it was delicious. I counted out 16 slices of bacon, which was around 1 pound, some a little more, some a little less, but I figured that 16 slices is 4 pieces of bacon for each member of my family of 4. 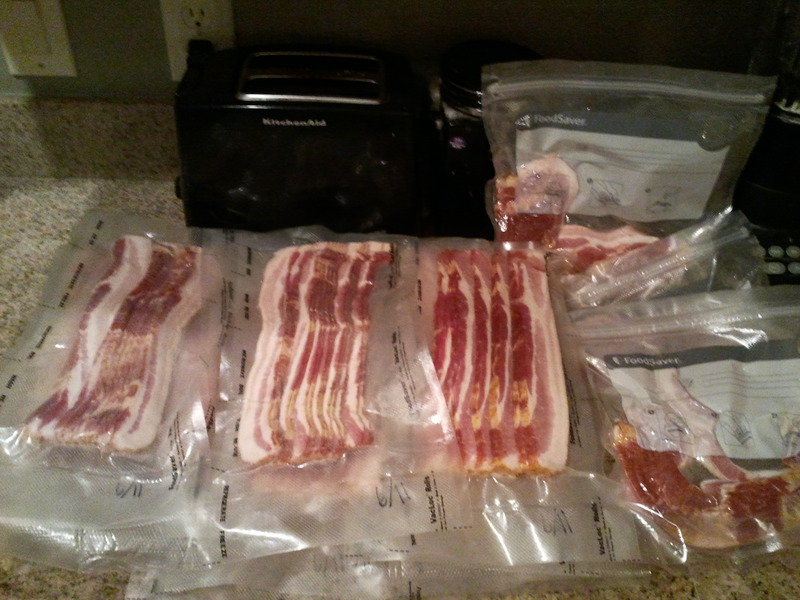 For 12 sets, I vacuum sealed the bacon to put in the freezer. The remaining 3 sets, I put in FoodSaver FreshSaver bags in the refrigerator. Next month, I’ll be picking up more of the ground beef, which is perfect because I am out of ground beef from the March event!